FEE have successfully joined forces with the Online Centres Network to run online IT courses and a range of ITQ digital workshops for refugees, BME women, and unemployed in Derby and Midlands. 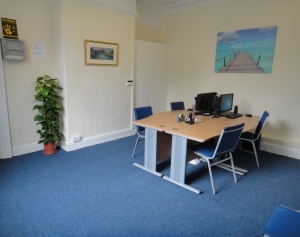 The FEE is located at 119 Osmaston Road very close to Derby City Centre, and we have spaces available to hire. We have space for small workshops and a larger meeting room with tea and coffee available. We have a unique twist for any organisation or individual who wants to come and use our facilities. Two of our directors are from the Persian Community and one of our key aims is to share Persian heritage which includes Persian food! So, if you want to book our rooms for meetings you won't just get a boring old cup of tea! Persian food can also be provided on request. 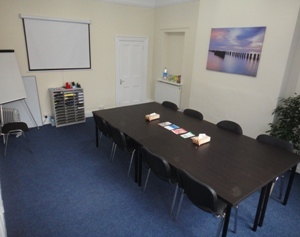 We have a recently decorated conference room which can accommodate up to 15 learners / delegates. The space is very flexible and can be cleared for any kind of class / activity. We have a projector screen, free Wi-Fi, and lots of comfortable chairs! Tea and coffee is provided as part of room hire and we offer very competitive prices with generous discounts for community groups. We also have a computer suite so that you can use to browse the internet for a nominal fee. Room hire could be as little as £8 per hour if you're a community group. Please contact us and we can discuss your requirements.